G Suite vs Office 365: Which is Better for Your Business? Set up email for your company domain and easily manage email users. Get a suite of document tools for your entire company. Store your documents on the cloud. Both G Suite and Office 365 are built around these core offerings. You get email management, a suite of document tools, and online storage. There’s a few other bells and whistles but that’s the vast majority of the value from both products. While companies used to manage their email accounts on their own and purchase individual licenses for document tools, that era is quickly fading. All the major software companies including Microsoft and Adobe are doing a hard push into cloud software that’s purchased via a monthly subscription. While it’s still possible to set up your own email through a web host, you might as well make it a lot easier while also getting a suite of document tools for your company. For any company with even a few employees, you’ll need to get G suite or Office 365. So which one’s the best? Should we purchase G Suite or Office 365? Below, we’ve broken down the winner down by specific categories and included our overall recommendation at the end. Before we get into the feature-by-feature comparison, there is a simpler way that we recommend most companies make this decision. It’s how we make this decision ourselves. I look around to customers, competitors, vendors, and employees. Then I eyeball whether G Suite or Office 365 is more popular. Take my friend, she’s a lawyer. She finished law school a few years ago and is millennial. She’s super comfortable with all the G Suite tools: Gmail, Google Docs, etc. She prefers that tool suite herself. But when she joined a law firm, she discovered the entire legal industry is deeply entrenched with Office 365. Her life now runs out of Outlook and Microsoft Word. She told me that some of the firm Partners didn’t even know how to open a Google Doc. If I was working in that environment, would I ever consider G Suite? Absolutely not. It’ll create way too much friction in the day-to-day. I’d be the first to advocate for Office 365 even though I personally prefer G Suite myself. The last few years, I’ve worked in tech and startup environments. It’s the exact opposite of the legal industry, nearly everyone I know uses G Suite heavily. If I sent a Microsoft Word doc to a few of the folks on my team, I’m not sure they’d know how to open it. I base 95% of my decision of G Suite vs Office 365 on which of them is the more dominant choice in my industry. If a clear answer just popped into your head, my recommendation is to stop reading and go with that choice. What if the industry uses both? What if your company is already using both? 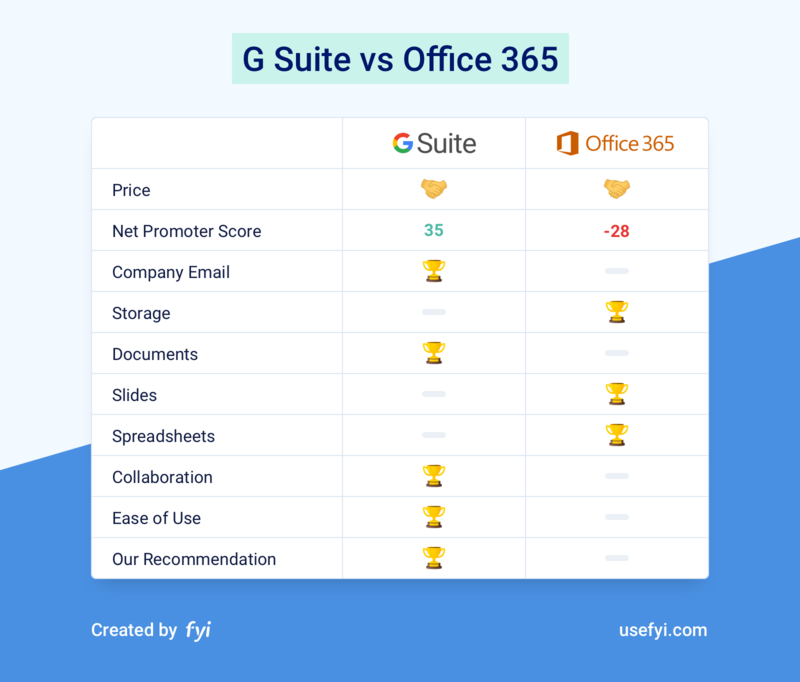 It’s shockingly common, lots of teams get split between G Suite and Office 365 tools. This is why we built FYI to search and organize all your documents no matter what tools your team has been using. 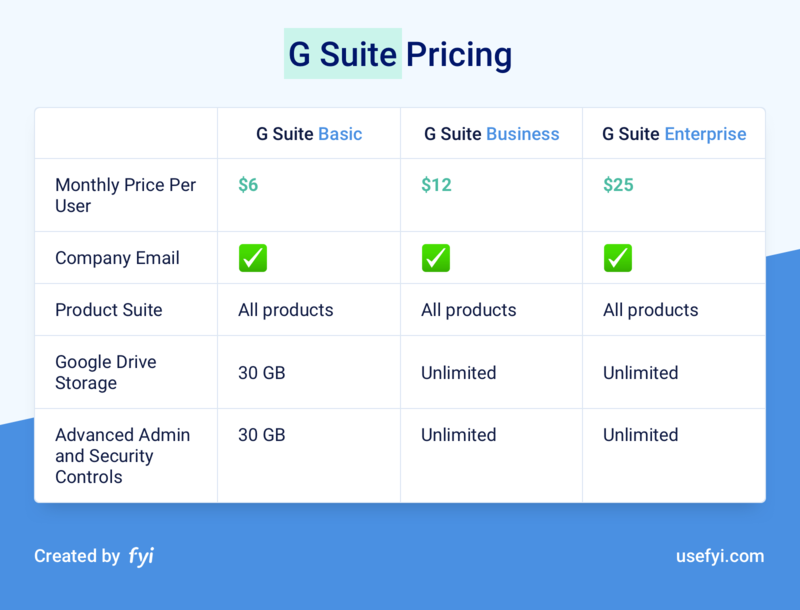 G Suite used to win on pricing but has recently increased the price on their Basic and Business plans. For both product suites, the basic plan with some restrictions starts at $6/user. For most folks, the Office 365 plan at $8.25/user isn’t a viable option because it doesn’t include company email. We can ignore that plan. 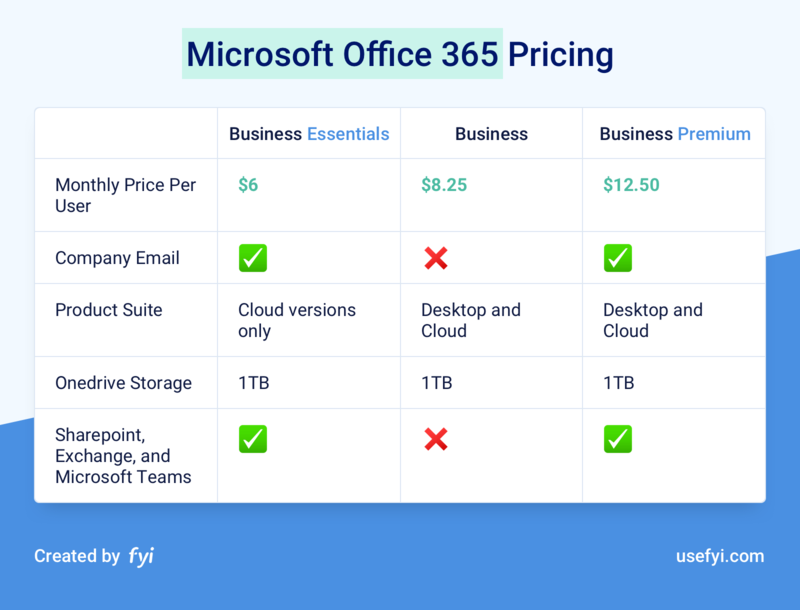 The “fully featured” tiers that have everything a business needs are $12/user for G Suite and $12.50/user for Office 365, almost no difference. For pricing, it’s a draw between G Suite and Office 365. We survey hundreds of users on which document tools they preferred by using an industry rating tool called Net Promoter Score (NPS). It’s a rating of -100 to 100 that allows us to determine how happy people are with a given tool. We have more details on how the survey and NPS methodology works here. G Suite received an NPS of 35. Office 365 received an NPS of -28. That’s a huge difference in user preference. Users think G Suite is a good product. Office 365 leaves a lot to be desired though, users we surveyed actively dislike it. The clear winner on overall user satisfaction is G Suite. To be honest, there’s very little difference between Gmail and Outlook these days. For all intents and purposes, they’re the same product. So it comes down to personal preference. Since Gmail launched in 2004, most of my working career has been spent using Gmail, I’m much more comfortable with it than I am Outlook. Gmail is so ingrained in me at this point that I can’t imagine ever switching to Outlook. To this day, I can’t get comfortable with a viewing plane in my inbox like the default Outlook. Yes, I know I can turn this off in Outlook. Yes, I know I can turn it on in Gmail. After using the default view in Gmail for so long, even the thought of a viewing plane gives me the shivers. For me, I prefer Gmail. But lots of folks prefer Outlook instead and that’s perfectly valid. There’s no rational reason to choose one or the other, it’s 100% personal taste. This isn’t just about Gmail vs Outlook, it’s about the entire email package that you get in G Suite vs Outlook. For email as a whole, I have to rule in favor of G Suite for one simple reason. The middle tier of Office 365 does NOT include company email. It’s strange, I have no idea why they’ve chosen to do this. The Office 365 plans at $5/user and $12.50/user both include company email but the plan at $8.25/user does not. Every plan on G Suite includes company email. So I have to give this one to G Suite. Office 365 wins because it offers 1 TB of storage on the lowest plan. No matter which version of Office 365 you choose, you’ll get 1 TB of document storage. Yes, G Suite offers unlimited storage but only on the Business and Enterprise versions. On G Suite Basic, you only get 30 GB of storage. This is laughably small. With G Suite, you’ll need to plan on either upgrading to the Business plan for unlimited storage or to store all your documents elsewhere like on Dropbox. Either way, the inconvenience from the limited storage on G Suite places it behind Office 365 on storage. If you were only looking at the Business and Enterprise editions, the unlimited storage in G Suite does technically beat the 1 TB storage on Office 365. But for most businesses that have normal storage needs, they’re effectively the same. Unless you’re storing an abnormal amount of files or have become a rather large company, you won’t notice the difference. If products won based on the number of features they had, Microsoft Word would beat Google Docs easily. In some product types, like spreadsheets, advanced features really do add extra value for folks. For Word documents, the vast majority of us need usability more than advanced features. Without a doubt, Google Docs of G Suite has much better usability than Microsoft Word. By having fewer advanced options in Google Docs, Google has been able to spend more time perfecting each element. And when you’re working out of Google Docs all day long, those ting improvements make a huge difference. I understand the hate towards Microsoft PowerPoint. The phrase “death by PowerPoint” exists for a reason. But Google Slides never really hit the mark for me. It lacks a lot of features of PowerPoint without being any easier to use. Unlike Google Docs, many basic UI elements still feel slightly off like automatic alignment. Alignment snapping has become a standard in PowerPoint and Keynote for years but in Google Slides, the alignment is always slightly off. Many of the Google Slides features are like this. They exist but lack that final polish. I’d rather build a deck out of PowerPoint than Google Slides any chance that I get. First, Google Sheets is pretty good. For a cloud-based spreadsheet that focuses on usability, Google Sheets is shockingly good. And for most folks that are doing basic spreadsheet work, Google Sheets will be enough for them. It’s what I use in my day-to-day. However, the extra horsepower and advanced features of Excel are too valuable to ignore. I have a few friends that do serious spreadsheet work and Excel is the only legitimate option, they don’t consider anything else. G Suite really shines on collaboration. The sharing and collaboration features in G Suite aren’t just slightly better than Office 365, they set an entirely new standard of what great document collaboration looks like. Collaboration in Google document tools includes four main features. Simultaneous editing. Since the beginning, being able to edit the same doc in real-time with multiple users separated Google Docs from every other document tool on the market. While it sounds minor, it completely reshapes work behavior at a company. Work becomes more collaborative, brainstorming happens more frequently, and group editing becomes seamless. Document comments. Being able to highlight a specific part of a document and leave a comment or question has completely changed the way I work. Instead of trying to summarize all my comments in a follow-up email or chasing down a colleague to go over everything, I can quickly leave all my comments in the document itself. Since I can tag any part of the document and leave a comment, my colleague has all the context they need to know what I’m referring to. Not to mention the ability to tag people in comments, assign tasks, and reply. Document sharing. Whether you want to share a document with individuals, the entire company, allow them to edit or just view, and any combination of the above, the sharing in G Suite has you covered. Having everything in the cloud by default also makes this a lot easier. Share the URL and you’re good to go, no need to pass files back and forth. Suggesting Edits (Track Changes). Track Changes has been in Microsoft Word for a long time. Instead of editing the document directly, changes are highlighted for someone else to accept or reject. Google Docs added the same feature and called it “suggesting.” Google Docs got the UI for this feature perfect. There are no redline documents of death. Even a completely edited document can be reviewed and cleared within a few minutes. Office 365 does have some of these same features but the execution is so poor that it can be frustrating to use them after getting used to the collaboration in G Suite. No contest, this one goes to G Suite. When you’re looking for the easiest and simplest set of tools to use, go with G Suite. During all our research and surveys, users frequently told us how much easier G Suite is compared to other document tools on the market. Other than collaboration, it’s the primary reason why G Suite has a much higher NPS than Office 365. Granted, the simplicity does come at a cost for G Suite. Users agree that it’s not as powerful as Office 365, particularly on slides and spreadsheets. If you need raw power and advanced features, it’s worth skipping the better usability in order to get your hands on Excel and PowerPoint. In this case, it’s a trade-off between simplicity and power. G Suite wins on simplicity, Office 365 wins on power. Based on the much higher NPS and the clear wins on collaboration and ease of use, we do recommend G Suite. But like we stated at the beginning, chose the option that’s most entrenched in your industry. If that’s not a concern or both sets of tools are used equally, we recommend G Suite.